A Spring Tea Party Package at The Victorian on 10th offers a special time for Moms and their children to experience an authentic Victorian Tea Party. Children keep the antique cup and saucer as a treasured memento. Your table is set with antique plates, cups and saucers and an assortment of specialty teas. You and your littles will dine on Tea Sandwiches and delectable English Pastries. And if you’d like to spend some time baking together, a side table will have all the necessities to bake and frost your special cupcakes. 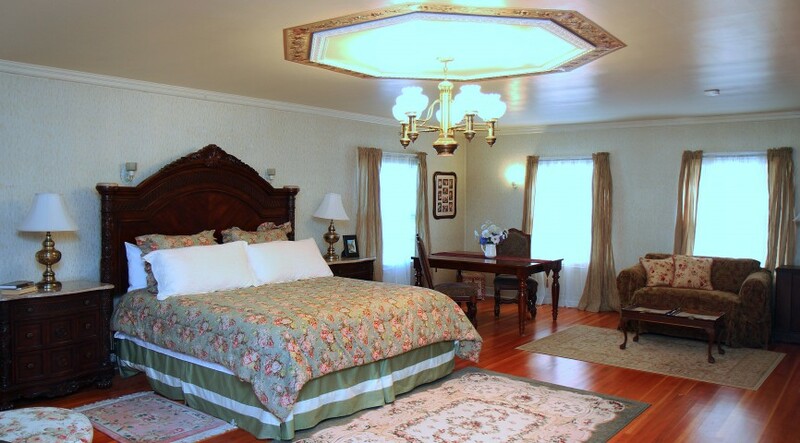 The Victorian on 10th is a family, and pet, friendly inn that has been lovingly restored to it’s original 1896 Queen Anne Victorian beauty and offers a “home away from home” quality. Located just a few blocks from McMinnville Oregon’s 3rd street, voted the “Best Main Street in America” by Parade Magazine in 2014, the historic building is a 2,600 square foot Victorian in the heart of the Willamette Valley Wine Country. 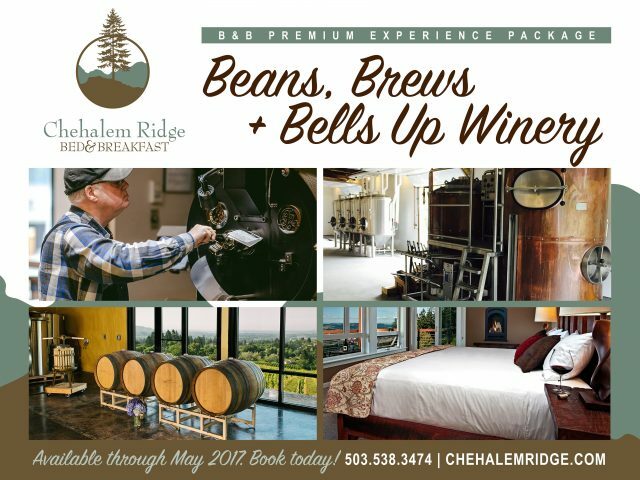 Beans, Brews and Bells Up Winery, a masterly created Bed and Breakfast Package from Chehalem Ridge Bed and Breakfast, in Newberg, Oregon. Artisan lunch from Newberg Bakery. 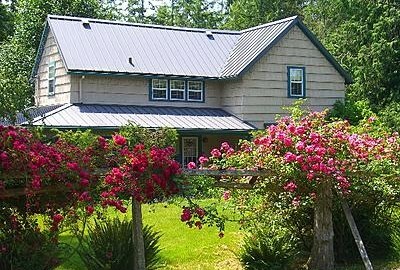 Perched on eight acres atop Chehalem Mountain overlooking the Willamette Valley and Coast Range, Chehalem Ridge Bed and Breakfast offers four guest rooms and one suite, all with en suite bathrooms, offering a peaceful retreat between adventures. More than 60 wineries are within a 20-minute drive of the contemporary house. Kristin, a former pastry chef, has been hailed by past guests for her mouthwatering gourmet breakfasts, house-made treats and jams, immaculate housekeeping skills, and charmingly quirky sense of humor. Woo your honey with a romantic stay at the R. R. Thompson House in Carlton on Valentine’s Day. Actually you can romance your sweetie now through Valentine’s Day with this special offer: Stay one night and receive a second night for half price! When you choose R. R. Thompson House as your lodging choice in Carlton you’ll create the perfect wine country get-a-way. Stroll just a few blocks to the explore dozens of small wineries, unique shops and wonderful restaurants in Carlton’s historic pioneer downtown. R. R. Thomspon House has five beautifully appointed suites and rooms, each named after a flower which can be found in the artistically designed gardens. The spacious Rose and Lavender Suites and the more intimate Magnolia, Lilac and Garden Rooms all have deluxe, pillow top king or queen mattresses and crisp, luxury linens. Carlton is also home base for the globally respected Yamhill-Carlton American Viticultural Area. The Sandlake Country Inn Bed and Breakfast near Pacific City, Oregon is secluded and luxurious, making it the perfect location for your romantic Oregon Coast getaway. 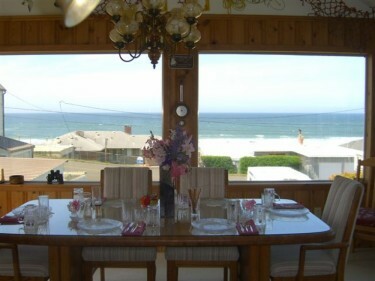 Their Romance Packages will enhance your honeymoon, anniversary celebration, or vacation retreat for two. And for those who want a truly secluded getaway, how about dinner delivered to the privacy of your room? Guests at Sandlake Country Inn enjoy the privacy and pampering of having their sumptuous breakfast delivered to the privacy of their room Their packages are thoughtfully designed to help you create wonderful memories to cherish for a lifetime.